John CAGE and Morton FELDMAN: Radio Happenings (1966-67). John Cage, Morton Feldman (speakers). mode 289 or Edition MusikTexte 001. (1 DVD, 1 book) (http://www.moderecords.com/ or http://musiktexte.de/). It’s an invitation, a question and a challenge that one composer utters to another with utmost familiarity. And so begins five hours of rambling conversation between Cage and Feldman, captured for the radio at WBAI in New York City. There were five sessions: July 9, 1966, July 13, 1966, December 28, 1966, and two on January 16, 1967. A member of the Pacifica Radio Network, WBAI has its transmitter atop the Empire State Building. This was the station that in 1973 broadcast George Carlin’s comedy routine which eventually led to a Supreme Court case, and subsequently the FCC’s list of seven words that can’t be said on radio or TV. This book and DVD are a co-production between mode and MusikTexte. English and German transcriptions of the conversation are side by side. The German translations are by Gisela Gronemeyer; the preface is by Christian Wolff whom both composers mention frequently. Footnotes explain the passing references. Close attention reveals that the printed English text does not completely match what Cage and Feldman are saying but is edited for comprehensibility. There are long pauses. Once noticed, matches are struck implausibly often. The radio studio must have reeked of cigarettes. Around the time of these recordings, Feldman was 40 (he would live 20 more years) and Cage was 55 (but he would outlive Feldman by 15). Feldman’s long pieces were far away; the graph-paper pieces were closer. Feldman’s Ixion, The Possibility of a New Work for Electric Guitar, Two Pieces for Three Pianos, In Search of an Orchestration, and other piano pieces are mentioned. The Viola in My Life series would not be written until 1970-71, Rothko Chapel following in 1971. Feldman was thinking about time and balance, topics which would lead him towards the longer pieces. Cage’s number pieces were far in the future. The touring and collaboration with Tudor, the Variations series, explorations with chance and performances, “happenings,” and other theatrics were recent. Just around the corner, HPSCHD (1967-69, co-created with Lejaren Hiller) may be that period’s most representative opus. Cage actually mentions receiving a commission from the Swiss harpsichordist Antoinette Vischer which grew into HPSCHD. Both composers would return to more conventional notation. We hear two pals talking, yet I suspect they are moderated but teasing knowing that the tape is rolling. The duo coquettishly postulate, respond and cajole. In and of itself, Feldman’s Brooklynese drawl and inflection are mesmerizing. Cage adopts a populist stance, but not without some pretension. Despite their mutual admiration, shared experiences and erudition, there is a bit of city mouse (Cage) vs. country mouse (Feldman). Both composers refer to trips they have made, lectures given, commissions received and recent performances. The curtain falls away at the end of the fifth Happening, when, unbeknownst to them, the tape continues to roll as they pack up to leave and congratulate each other, remarking on their performance. There is plenty of name dropping. We learn they both revere Varèse (who had just died in 1965) and Christian Wolff. Cage glows about Schoenberg, Daisetsu Teitaro Suzuki, Buckminster Fuller and Marshall McLuhan. Webern was important to both at one time (as the story goes, they met while walking out of a concert where Webern had just been played). They also mention Cardew, Boulez and Stockhausen, but the last seems more of an annoyance than a colleague. Cage and Feldman criticize the river’s flow while standing in the middle of it. They talk about art and music, about creating and teaching, about how things just aren’t what they used to be. Evidently they are tickled to proselytize and reflect, after all who wouldn’t welcome the luxury of several unimpeded conversations about art and creativity? Fifty years on, several concerns sting freshly. Current events enter the conversation: the Vietnam War, globalization and inequality. It’s 1967 and they are bemoaning how education has changed, and how ideas are no longer discussed as they once were. It’s apparent that they were more educated than we are today. Given that each did so much more, it’s an illuminating glimpse of a particular moment in their long careers. “4 Contemporary Sound Poets.” Tomomi ADACHI: Ursonate 2 (2015). Owen F. SMITH: Portrait as I (2015); Etude for Long Vowels (2015); A: Poem in the Round (2015); Meditation on O and A (2015); U Sonata (2015); Bell-O (2015). Duane INGALLS: Drifts #2 (2015); Half Way Home (2015); Spivstra Diobel (2015); Father’s Boyhood (2015). Jaap BLONK: Inside Outcry (2014). Pogus 21083-2 (1 DVD) (http://www.pogus.com/). 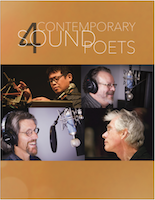 The title indicates “sound poets,” but these four could be considered electroacoustic composers whose primary sources are the widest range of vocal sounds imaginable. Tracks swirl and spin (this DVD is meant for five-speaker surround systems, Dolby Surround or DTS Surround, but can be played through stereo speakers or headphones). It isn’t just that recording and diffusion technology plays a role, but also that the sound poets are using digital techniques to manipulate the sounds they make. Kurt Schwitters looms in the background as evinced by Adachi’s phonetic bath, Ursonate 2, but there are also works where the poets recite over a background, such as Ingalls’ despairing Half Way Home, whose text is comprehensible and reasonably linear. Departing from Schwitters’ 1932 monument, Adachi’s Ursonate 2 combines multi-tracked live recordings of himself unleashing surprising sounds and includes extensive electronic manipulation and the deft sound processing of a choir. The Scherzo sounds most like Schwitters and the final movement affords the listener a chance to provide a cadenza. Smith’s pieces investigate vowels. Sometimes the sources are discernable, as in the recited appearance of the letter “i” in Portrait as I, or the studio work obscures the composer’s voice to create something approaching granular synthesis as in Etude for Long Vowels and Meditation on O and A. A: Poem in the Round bounces around the listener reflecting the discovery of digital manipulation and copying. Ingalls’ Drifts #2 simulates weather and as already remarked, Half Way Home has discernable words. Blonk’s entry is a lengthy 33-minute work. Over a processed background derived from his voice, Blonk prepared a live performance, extreme vocal expression meeting current electroacoustic techniques. 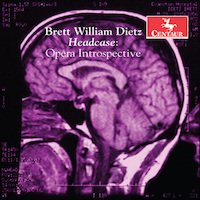 Brett William DIETZ: Headcase: Opera Introspective (2006). Dennis Jesse (bass), New Music Raleigh: Karen Strittmatter Galvin (vln), David Meyer (vlc), Mary Boone (fl, picc), Anthony Taylor (clar, b-clar), Jesse Kapsha (pno), Shawn Galvin (perc), Brett William Dietz (cond.). Centaur Records CRC 3474 (1 CD) (http://www.centaurrecords.com/). A wonderful opera with pre-recorded tape bits that chronicles the composer’s experiences recovering from a stroke. Dietz was 29 and made a full recovery, but had to relearn how to speak as well as read music. Texts are extracted from a journal Dietz wrote during recuperation. The music vividly reflects the terrifying ordeal. Hard to tell for certain, but Dietz questioned his own understanding of language. It’s a personal opus, and yet, we’re to perceive this as entertainment and attribute the erratic and scary bits to the healing process. We know that Dietz endured, but there are precarious moments skillfully realized during this 40-minute tightrope walk.